September 24, 2015 marks the 10th anniversary of land fall of Hurricane Rita in Southwest Louisiana, only a few weeks after Louisiana was devastated by Hurricane Katrina. September 24, 2015 marks the 10th anniversary of land fall of Hurricane Rita in Southwest Louisiana, only a few weeks after Louisiana was devastated by Hurricane Katrina. Surveying Louisiana’s coast 10 years after that record-breaking Atlantic hurricane season in 2005, stories of survival, recovery abound as the region remembers the storms at a special event held in Lake Charles Saturday, Sept. 26. As Southwest Louisiana bounces back, the National Hurricane Museum & Science Center is sponsoring “Hurricane Awareness Day” from 9 a.m. to 3 p.m. on Saturday, Sept. 26 at the Lake Charles Civic Center, 900 Lakeshore Dr. The hurricane day will showcase exhibits and demonstrations by emergency responders, activities for families on lessons learned and better preparation, as well as celebrate the music, food and culture of the region. Southwest Louisiana was especially affected by Hurricane Rita, with parts of Cameron Parish being totally destroyed; it’s estimated that the parish lost 95 percent of its homes, businesses and infrastructure, including every single power line. Coastal communities like Holly Beach were wiped away, but have rebuilt stronger, due to the current building codes and regulations. Rita’s economic impact and death toll weren’t as high as Katrina’s, but that is in part because the second hurricane hit a much less populated area of the coast. In a true ironic twist, many residents of the parishes near New Orleans had temporarily relocated to hotels in Southwest Louisiana, requiring emergency personnel to take care of both residents and displaced visitors. 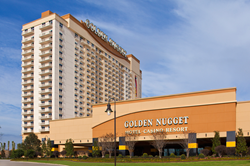 Harrah’s Hotel & Casino was destroyed and didn’t rebuild, but its riverboat gaming license went to the $700 million Golden Nugget Lake Charles, which opened in December 2014. The Lake Charles Regional Airport was ruined by Hurricane Rita, but was rebuilt in August 2009 and now serves as a gateway for United and American Airlines; the $28 million terminal building makes flying to and from Lake Charles more efficient than ever. It wasn’t just humans who were affected by the storms; the brunt of the burden was borne by the region’s natural resources. Wetlands were destroyed and wildlife was killed as a result of the storm. The Creole Nature Trail All-American Road’s animal population – alligators, turtles, butterflies and birds – are back in abundance. Since the storms, the Lake Charles/Southwest Louisiana Convention & Visitors Bureau invested in a mobile tour app that allows visitors to explore the Trail in six different languages, ensuring that all guests can understand the significant role nature plays in the coastal marshes. Hurricane Rita also damaged the Sabine National Wildlife Refuge’s Visitor Center, which welcomed more than 300,000 visitors each year prior to 2005. This past April, the new Creole Nature Trail Adventure Point opened in the town of Sulphur, closer inland than its predecessor. This fun, free attraction at the western gateway of the All-American Road helps immerse visitors in the culture, food, music and outdoor adventures that set Southwest Louisiana apart. One of the most anticipated new additions to Lake Charles is the National Hurricane Museum & Science Center (NHMSC), which is scheduled to break ground late next year following a 10-year planning process. The original vision for this project, prior to that fateful 2005 hurricane season, was to commemorate the 50th anniversary of Hurricane Audrey, which in 1957 took the lives of more than 500 people and devastated Cameron Parish. After the hurricane season of 2005, however, it was determined that the proposed facility should become a national museum focusing on STEM education. The center, now set to open in late 2018 or early 2019, will feature a variety of state-of-the-art interactive exhibits, a working National Weather Service station, and serve as a hub in a digital learning network. It’s a place where visitors can go to learn more about the power of Mother Nature and man’s ability to not just survive, but to thrive. Southwest Louisiana is thriving and open for business. Hotels, restaurants, attractions and parks are welcoming visitors eager to discover the beauty, nature and recreational opportunities, cultural experiences and delicious dining opportunities. For more information, visit http://www.visitlakecharles.org.